It's October, Black History Month. In my borough there are a whole series of events and workshops designed to celebrate what it means to be Black (and Black British), to explore our History and to remember the sacrifices of those who have gone before. My good friend is visiting from Atlanta at the moment, it always surprises me how whenever she breezes back, she brings so many fragrant winds with her. Fragrances of times past - both good and bad; followed by a whole heap of inspiration and always always winds of change. I've been reflecting on many things lately. Painful relationships I had to cut off, past hurts I had to let go of in order to move on to where I am now. And smiles... plenty of smiles and giggles - from Secondary School and Community College (in Barbados), to University (at Cambridge), to internships and first jobs, promotions... the whole gamut. Ten years ago - did I think I'd be where I am today? No. Fifteen years ago I didn't even think I'd be alive! But thank God that I am, cos I love who I am now and I am thankful for who I was then, because without the experiences in between I just wouldn't be ME. I also learned a lot during my 'lock- gate' post concerning latent attitudes and whatnot; and with this in mind I've decided to do a series of articles on the stories behind different hairstyles/lifestyles. 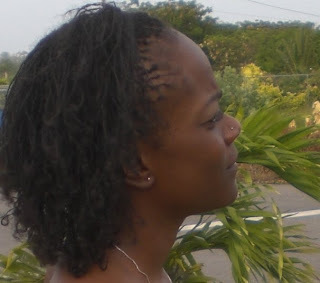 I have interviewed several of my friends and family who have hair(styles) that I admire, and I have combined that with my own take on why I find them inspirational. I've also decided to throw in a couple of female friends whom I admire but who have no particular Hair Story per se. These are the Her Stories.